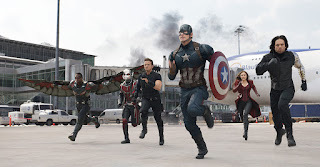 At this point the observation that the contemporary superhero film is an allegory for the war on terror, like pointing out that Godzilla is about fears of the atomic bomb or that Invasion of the Body Snatchers is about communism and conformity, that has become at this point so commonplace that it barely merits interest. What is interesting, however, is the way in which in the fifteen or so years of the cultural forms dominance it has progressed with our changing anxieties about the war. At the beginning the films were all about preventing some kind of apocalyptic attack, usually on New York City, functioning as a kind of wish fulfillment of the most immediate sort. As the war on terror has dragged on, different elements of this long war have filtered into the superhero film like the way the sound of an alarm becomes part of a dream, or, to complete the Freud reference, smoke from a smoldering bed sheet. The different subplots and themes of the film read like a list of headlines about the long war, everything from post traumatic stress to drones has been addressed in inverted superhero form. 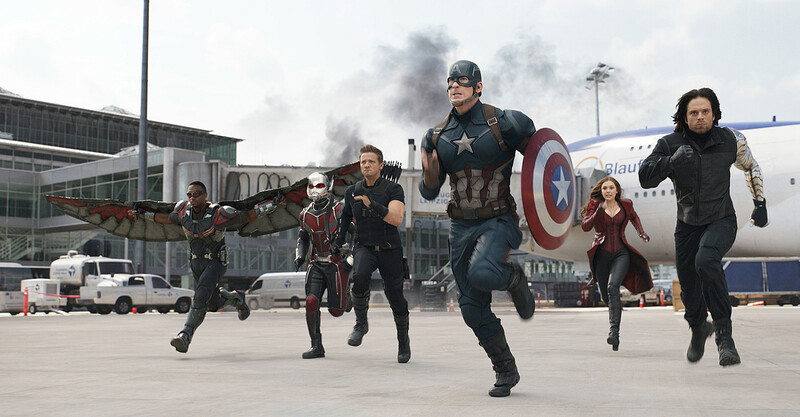 With Captain America: Civil War the subtext, or residues of reality, shifts to collateral damage as The Avengers are forced to confront the reality of the lives destroyed by all of those left in the wake of cool explosions, giant space slugs, and cities falling from the sky. The latest films focus on unilateral action, the UN as a the voice of the international community, and the destruction wrought by unchecked conflict could be seen as lessons for the "world's only superpower" from those with superpowers. The superhero film goes full circle; from the fantasy of power to the ugly reality of violence. As much as it is possible to read the film this way. It is important to recognize that collateral damage is not just a part of war, but also the "war" between competing studios and competing comic book movie franchises. Whedon already made it an issue in The Age of Ultron as a response to Man of Steel, and even a cursory scan of the various chat rooms of comic books sites will reveal a sort of spectacular inversion of realpolitik. There is more debate and discussion of collateral damage in Metropolis and Sokovia than in Baghdad or Afghanistan. Back in my day the merits of DC and Marvel were debated in terms of who could beat who in a fight, the Hulk or Superman, now it is a matter of which universe is more in accord with just warfare theory and the ideological demands of heroism. It is not a matter of just saying that sometimes a "cigar is just a cigar," or, more in keeping with the film, sometimes a "drone is just something that the Falcon shoots out of his winged jetpack." The very fact that these reality effects, references to torture, surveillance, and offshore detainment facilities, etc., function not just as plot points, but as ways to define and delimit different cultural products, reveals to what extent reality has become a kind of simulation--a dream that references only itself and no more so when it claims to be "realistic." Talking about dreams makes it possible to highlight precisely what is missing from the modern comic book film, and that is its pulpy weirdness. What is the point of bringing together cyborgs and supersoldier, androids and afro-futuristic kings, if it is not going to be weird or fun? Civil War has its fun moments, and perhaps the best Spider-Man/Peter Parker to grace the screen. There are moments that it gets so much exactly right; the big battle in the Berlin airport is like a big splash page of wisecracks and action that keeps on unfolding. However, all of this geeky fun of giants and androids feels the need to keep grounding itself in the pseudo-seriousness of the post-9/11 world. Our politicians have long since ceased to take the post 9/11 world seriously, there is no reason why our comic book movies should keep doing so. Comic book movies need a masked Baron Zemo, one who deals more in death rays than daddy issues, more M.O.D.O.K., more Kang the Conquerer, and more of a weird dream logic, and less self importance. As Horkheimer and Adorno argued, when serious art becomes light art, and vice versa, everyone loses. Concluding postscript. Perhaps Captain America is the end of the superhero movie 9/11 allegory. I say this not because it does not end with its big catastrophic event, an event that functions as a kind of stand in for 9/11, but because it ends with an event that has already taken place. 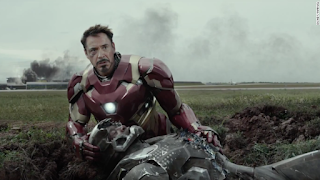 Captain America and Iron Man cannot do anything to prevent Bucky from killing Howard Stark, they simply have to deal with the effects of that event. What I find interesting about the conclusion is that it ties together the audiences disappointment, at least those who were looking forward to seeing Cap and Tony team up against a group of Hydra super soldiers, with the grim realization of loss and betrayal of the characters on the screen. So yes, I "want a realistic, down to earth show...that's completely off-the-wall and swarming with magic robots."